It was kind of a surprise to me that I'd get involved in fountain pen mania, but thinking about it from a more distant perspective, it seems pretty obvious. It's not just that I'm into historical fashion - I wear clothes I've made from repro 1950s patterns, sew on a machine with a treadle, use a safety razor, heat food up on the stove/in my toaster oven rather than a microwave, walk everywhere, make yoghurt, and cook everything from scratch. I'm an eccentric. It's not that I reject "modern life" or anything like that - I just enjoy using/wearing things that are solid and well-made (well, that's debatable when it comes to my dresses), I like how these things look and function, and, possibly due to my straitened social life, I don't really care if I come off as weird. Fortunately, people seem to find it charming rather than off-putting, anyway. Fountain pens first came into my scope in a discussion online about little luxuries you do for yourself. Someone said that they kept a journal on nice paper, written with a fountain pen. That sounded great to me - I've been keeping handwritten journals since high school, off and on - and so I started looking into it. It's not that I'd been consciously annoyed with ballpoint pens, but once I started writing with fountain pens, the physical act of writing went from being something I did as part of my day to something I actively enjoyed - which is at the heart of a lot of my old-fashionedness. I don't want to like my clothes when I pick them out and put them on later because they're there, I want to feel pleasure every time I put a dress on or look at myself in it. I want sewing to be fun not just because I'm creating something but because working the machine itself is interesting. There are a few things that make writing with a fountain pen so satisfying. One is just the "wow, I'm writing with a fountain pen!" effect. Another is the size of the section (the grip) - I've always had problems with my fingers cramping up on narrow pencils and pens, but most fountain pens have more heft. They also write more smoothly than ballpoints, without needing as much downward pressure. They're nice to look at, in your hand or on the desk. And you have thousands of choices of ink to use: inks in every color imaginable, with varying levels of saturation and lubrication, and with all kinds of qualities like waterproofing and shimmer and added scents. My collection, arranged in chronological order from left to right. The ones in the middle don't get used very much, but the two on the right (respectively, a TWSBI Vac Mini and a TWSBI Diamond AL Mini) are my everyday writers. Let's look at the vintage pens! 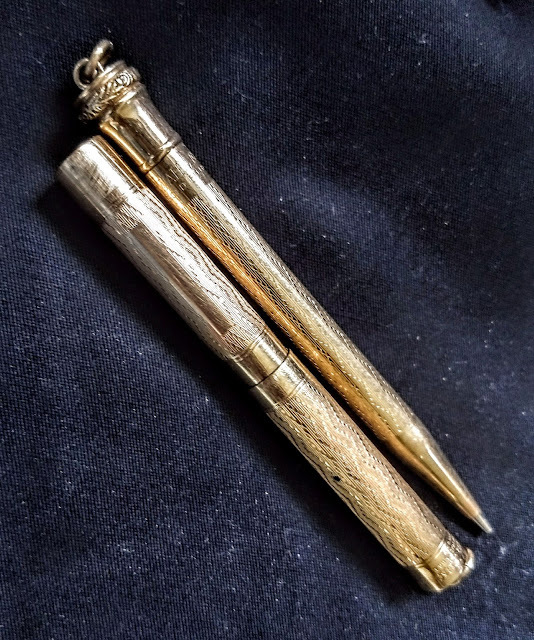 My oldest pen, with matching mechanical pencil, is from the 1920s. Wahl and Eversharp teamed up to make these sets. I'd like to put these on separate chains to wear like Joan Holloway, but the pencil needs some repair (the leads slide right out) and the pen's nib is very broad and wet, so it's not practical. Still, I could do it for a 1920s outfit sometime! 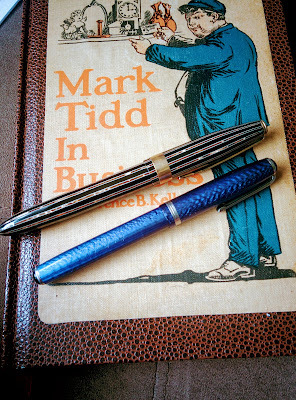 The striped pen on the left is actually my first vintage one - it's an Arnold, from the 1930s. Arnolds were fairly cheap (less than a dollar) and not high quality, so a lot of the ones that survive aren't in great shape, but this one is pretty good! It does have a tendency to suddenly blot, though, so I also don't use it regularly. 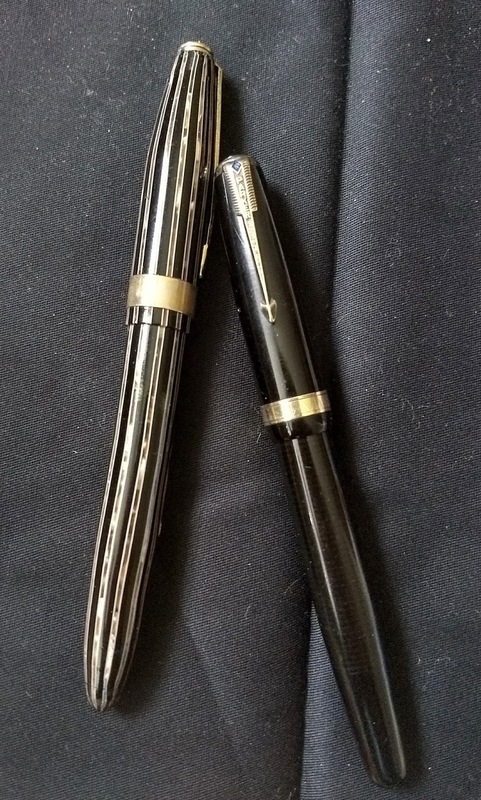 The pen on the right is a Parker Vacumatic made in late 1945 and used to be my grandfather's. You can see a bit of striping on the barrel - that's because it's actually partly clear! Where most vintage pens used rubber sacs to hold the ink, in a Vacumatic the entire barrel acts as the reservoir; by using a semi-transparent celluloid, the manufacturer allowed users to see how much ink was left and whether they needed to fill up before leaving home or the office. It's very difficult to clean out because of the vacuum-filling mechanism, so I only use Diamine Sepia ink in it, which looks nice and old-fashioned. I can do basic restoration, but I sent this one away to be professionally cleaned, and it was worth it! 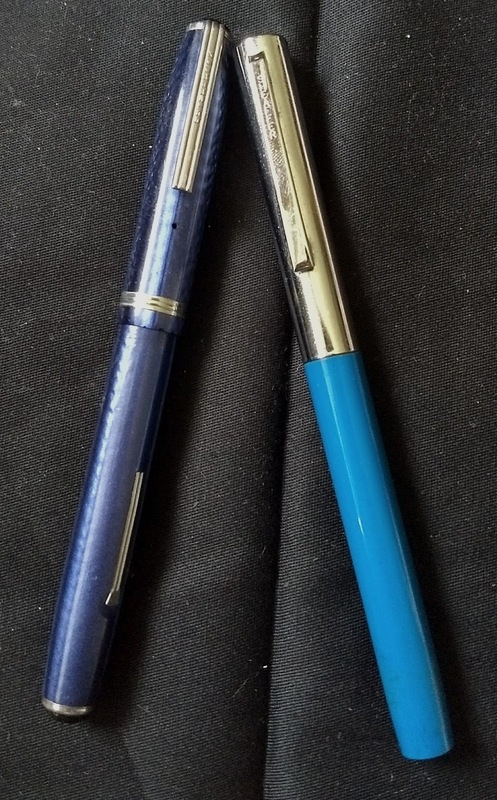 The Esterbrook pen on the left is another cheap type - this particular one is an Esterbrook S(mall) J, but they also came in the slightly longer L(adies) J and the longer and thicker J styles. Unlike Arnold pens, which few people are specifically into, Esterbrook's range of colors and standardization of size leads a lot of collectors to try to make a full set. What's really great about them is that the nibs were made to be easily removable, and Esterbrook sold a whole range of them separately from the pens themselves. (More specifics here. The nib in this pen right now is a 9314-F, fine and with a slight tilt to the tip.) You can get pretty much any one of the nibs that you want on eBay, used or as New Old Stock. The pen on the right is a "school pen" (ie, it's cheap, so it's good for students) made by Sheaffer, which was also my grandfather's. I don't tend to write with it because it's been so well-used that the nib is actually worn into the wrong shape! But I like to have it. 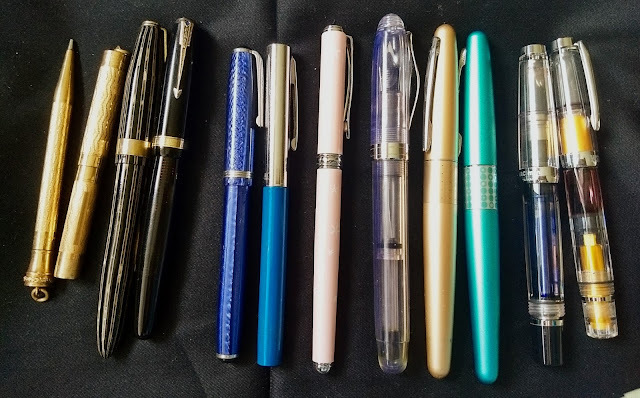 Fountain pens can become an expensive obsession (certain vintage models, limited edition modern pens, and hand-crafted masterpieces are worth a lot of money), but as long as you focus on having instruments you like writing with rather than going for prestige, there's no reason to spend very much. Your vintage pens are beautiful! I used fountain pens with disposable plastic cartridges for a while, and they were lovely to write with. Later I saved some vintage pens from getting tossed by a negligent relative who assumed they were ballpoints and "tried" them using some force, to see which ones worked - sadly, they never worked very well for me, I think she'd damaged the points. Later I got some 50s/60s Parkers that haven't been manhandled, so maybe I should locate my bottle of ink and try them sometime. I see there's a lot of helpful information online nowadays! Thank you! You might consider sending off your damaged pens to have the nibs tuned - if the bending isn't too bad, the cost could be very reasonable. For sure, a university diploma in at this time's employment market is crucial. Nonetheless, entry to many schools and universities at this time have additionally risen to such aggressive ranges that admission to such requires in depth preparation, particularly in taking the doorway exams, together with the writing of an Admission Essay or graduate faculty admission essay, together with MBA essay. if you want to know more about QandA then click here or visit our website.